Yesterday was one of those perfect days. The kind of day where in middle of a long January you think of spring and that is the day you think of even though there was still a nip in the air (you don't remember that part). The first day that you leave your windows and doors open and can smell fresh cut grass in the air. Everyone you see is smiling big grins and greets you with excitement because their happiness can't be contained, even for a stranger, even while taking out their garbage. The day where you buy your first little primroses for the season and a bouquet of tulips for your table. Your dinner looks better, your house looks cleaner, your friends/kids/family all seem extra wonderful. Your muscles are sore from pulling those weeds you have been avoiding or sanding the table that has been on your to-do list all winter, and it feels so good. That was the kind of day it was yesterday, the day you know spring really is on its way. Now what does this super happy and lovely feeling make me want to do? Buy some new things of course! I am so in love with that bag! Want. Now. Love those little green flats too. These two things I will surely be obsessing over for an indefinite amount of time. And a basket for flower clippings is one of those things I always forget to buy but wish I had. I recently did just get a spring scarf that I really like but the colors in this scarf are so pretty, non? I have never tried one of those candles before but I can only imagine that I would love it and I do need to get some lighter spring scents to replace my musky and rich winter candles. I am a vase hoarder, in the spring and summer I almost go into panic mode if I find my house free of fresh cut flowers, so I can always use a nice new vase. So, yes, I want everything. That little spring teaser day sounds wonderful. The weather forecast is predicting snow/snow showers for the next three days. I am not looking forward to it...The green flats are adorable and the scarf looks like a perfect spring accessory. How I wish our yesterday was like yours! I'm still waiting on spring here..but I guess I could rush it along with fresh flowers and spring-y things like that scarf and basket! You should buy yourself that bag, ahem. ;) I'm a bad influence, aren't I? Oh, I want a pretty, colorful scarf with pompoms. This collection is so perfect. 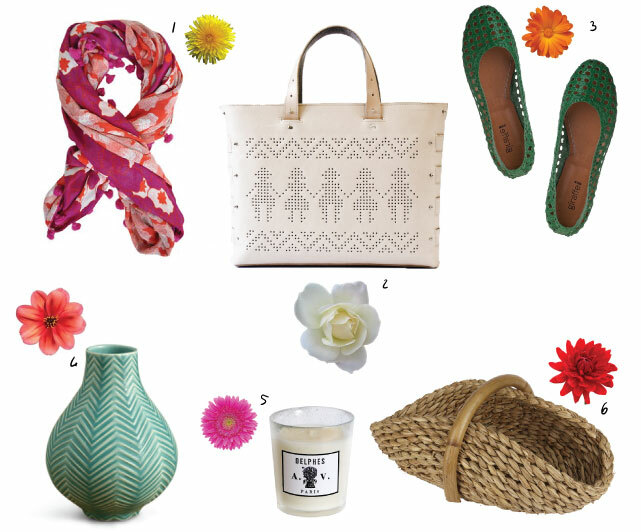 Creating a wish list of spring inspired items is a great way to beat the winter blues and ring in a new season. We had a taste of spring here this past weekend too. It was so nice! Today, we're back to gray and high 60's. It's ok, I'll take it. Besides, us Southern Californians really have no business complaining about the weather. Sounds like the most beautiful, wonderful, perfect day. I love how you described it. I'm sending happy spring wishes your way! It seems like everyone celebrated spring yesterday! Even London had sunshine and warm air, it was blissful! It put me in the mood for shopping too - I love the beautiful vase and the candle!